If you are sensitive to the taste of a medication or you have allergies to dyes and/or preservatives or have family members who have difficulty in taking medications…compounding may be the solution. 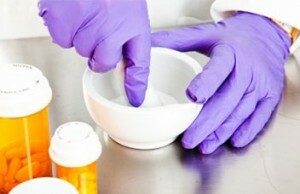 Customized medication compounding allows our pharmacy to formulate drugs that may not be commercially available. By working with your doctor, we can customize the strength and dosage form of a medication to your needs. Talk to our pharmacy staff at Glades Drugs today to see if our compounding services may help you!